Countless community and global needs have been met by nonprofits. And undoubtedly, new solutions will inspire others to consider this path. Yet critical to success is knowing that not every idea or initiative lends itself to starting a new nonprofit organization. In fact, some ideas are best implemented through alternative methods. Bottom line: pursuing the "right" course requires research, communication, and planning. Please read on. What other organizations in your community – and beyond – are focused on your interests, and is there an opportunity to work through them (e.g., fiscal sponsorship) or partner in other ways? Perhaps most important to a group’s potential for success is part four of the Starting a Nonprofit Organization guide. It outlines the steps to developing a business plan. A basic template for creating one – including a staffing plan and budget – can be found at the end of the guide. The importance of a business plan can’t be overstated. While a nonprofit organization is different in many ways from a business or for-profit, from an operations perspective, there are many similarities. In fact, when you think of starting and running a nonprofit, imagine that you're about to start a small business and what that entails. Then add to it nonprofit-specific government requirements. Getting legal or other professional help when starting a new organization – while not required – is one way to ensure compliance with state and federal requirements. One organization to note is Wayfind (formerly Washington Attorneys Assisting Community Organizations, or WAACO). Wayfind provides pro bono legal assistance to nonprofits, so groups can focus on their work in the community with less concern about legal issues. Help with forming a nonprofit (e.g., state incorporation and application for federal tax-exemption status under IRS Code sec. 501(c)(3)) is a service Wayfind and others offer. Yet here again, having a business plan is an important step. For example, one of Wayfind’s eligibility requirements for a start-up organization is that it demonstrate that it has such a plan. 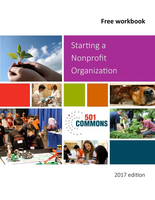 501 Commons and Wayfind are not the only options for help with starting a new nonprofit. A number of highly skilled consultants – many of whom serve the whole state and beyond – are also knowledgeable in this and other areas. Some have experience with particular nonprofit subsectors, like arts and cultural organizations, while others have worked with groups serving diverse communities or specific populations. To find these service providers, including those who’ve been evaluated by 501 Commons’ review process, visit the Nonprofit Resource Directory’s Consultants & Other Nonprofit Specialists page. Also, every month and around the State, there are numerous learning and networking opportunities for current and aspiring nonprofit professionals and volunteers. Take advantage of great trainings offered by service providers in the Resource Directory as well as those put on by 501 Commons. Some events cost a fee, while others are free! As noted earlier, there may be ways for community-benefiting ideas to become reality other than starting a new organization. The American Bar Association outlines some alternatives to forming a charitable nonprofit. One of these options is fiscal sponsorship (FS). "The term 'fiscal sponsorship' refers to an arrangement by which an established public charity (referred to as the 'Fiscal Sponsor') facilitates fundraising for a charitable project (the 'Sponsored Project') by, among other things, allowing the Sponsored Project to solicit tax-deductible contributions from individuals or grants from private foundations that the Sponsored Project is not itself eligible to receive directly." How does a fiscal sponsorship work? 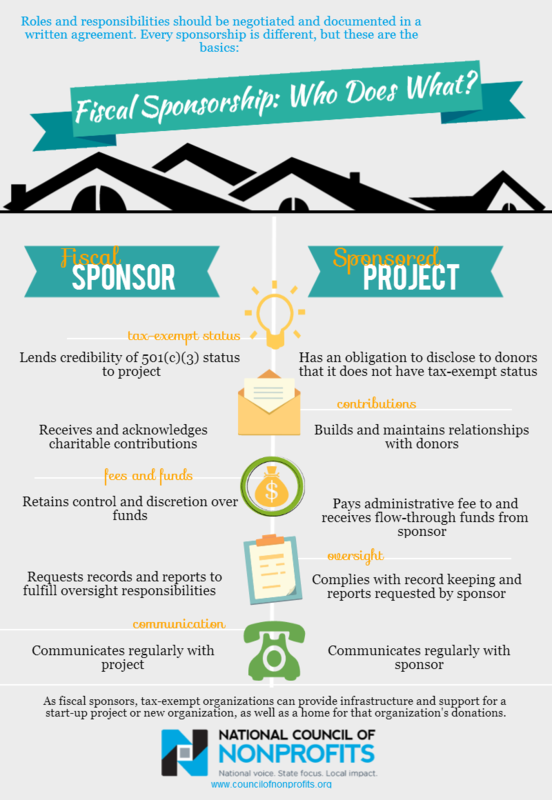 Check out this FS infographic created by the National Council of Nonprofits to quickly see who does what (i.e., fiscal sponsor vs. sponsored project). The Council's Fiscal Sponsorship for Nonprofits page provides its own description and additional resources. Remember: starting a new nonprofit organization begins as a question, not a conclusion. Take time to read what's involved in running a nonprofit and talk with others who are already in the sector – especially those working on the issue(s) you're interested in – before jumping in! The following documents will help you reach an informed decision. Note: When you file the Form 1023 or other IRS tax-exemption application form, you will need to pay the IRS a filing fee. You may also need to file an annual information return (e.g., Form 990) with the IRS sooner than you think. According to the IRS's website, "An organization should file a Form 990-series return if it claims exempt status but hasn’t applied for it, or if it has applied but not yet received an IRS letter recognizing tax-exempt status. "For recognition of exemption from the date of formation, organizations requesting recognition generally must apply within 27 months after legal formation of the organization. Organizations apply for exemption by filing Forms 1023, 1023-EZ, 1024 or 1024-A." Learn more about this IRS filing responsibility, including when to submit your information return and which type to submit, at an IRS page titled "Many tax-exempt organizations must file annual returns in May." Lastly, to help the application process go smoothly, read the IRS's top ten tips to shorten the tax-exempt application review process. Plus, Sandy Deja (Exemption Advisory Services) – found in our Resource Directory – offers even more specialized support for those completing Form 1023 or Form 1023-EZ on their own. The “Starting a Nonprofit in Washington State” toolkit invites you and your group to think about the difference you seek to make and the structure best suited to move forward. It leads you through key decision-making steps on whether a nonprofit is the best way for you to accomplish your goals. If you decide to move forward with forming a nonprofit, this toolkit guides you through the key compliance and good-practice steps to take it towards becoming operational.